Samatva, the social responsibility cell of SCMHRD, believes in equal consideration for one and all. The team conducts evening tutorial classes for 50 underprivileged children living in areas nearby the campus. Our aim is to impart holistic education to these young minds that focuses not just on their academics but also teaches them the importance of hygiene, sanitation and good manners. We try to spread happiness in the lives of our little ones by celebrating small occasions throughout the year, one such occasion being Joy of Giving. 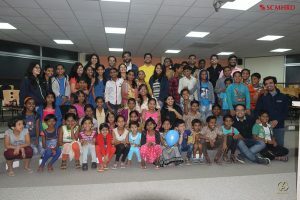 For this event, the entire batch comes together to gift stationary and other useful articles to the kids, wherein the kids’ needs are identified first by asking them. The faculty and staff members also contribute their bit for this purpose. Joy of Giving this year was conducted on 29th December, 2018. 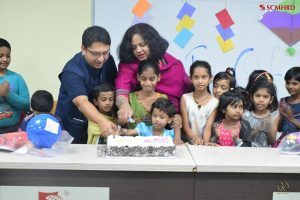 The event began with ushering the kids in and cutting a cake with them in the presence of the batch and our faculty. We then proceeded with distributing the respective gifts to children. It was a delight to spread much needed Christmas cheer in the lives of these young ones. A quirky and creative photobooth was also set up in the premises for the enjoyment of our batchmates once the distribution was over. It was a wonderful way of creating memories in their exciting SCMHRD journey. It gives the team immense joy to add our bit and support the dreams of these young, intelligent minds, aiding them in their journeys. ← Marx and crisis of the dead tigress – by Dr. Gurudas Nulkar.